The Rainbow Falls Historic Site consists of the namesake Rainbow Falls and a small series of waterfalls downstream. The five acres are developed with a parking area, trailhead, covered kiosk with historical and geological interpretive information, picnic benches and tables, a 0.15 mile trail from the parking area to the Falls, secondary trails along Fountain Creek, and viewing overlooks. The Historic Site will open on April 6 and the hours will be 10 a.m. to 4 p.m. Saturday and Sunday for April and May. $1 Donation per person. Parking for April and May will be available near the top of Serpentine Road via Highway 24. Park visitors will have to walk about a half mile down and up a steep grade to the entrance. The park will be open Saturdays and Sundays, 10 a.m. to 4 p.m. April and May, with extended hours for the summer. Rainbow Falls can be located from US Hwy 24 – exit south on Cave of the Winds Road; follow Serpentine Drive to the first hairpin turn; the parking area is on the west side of the road. 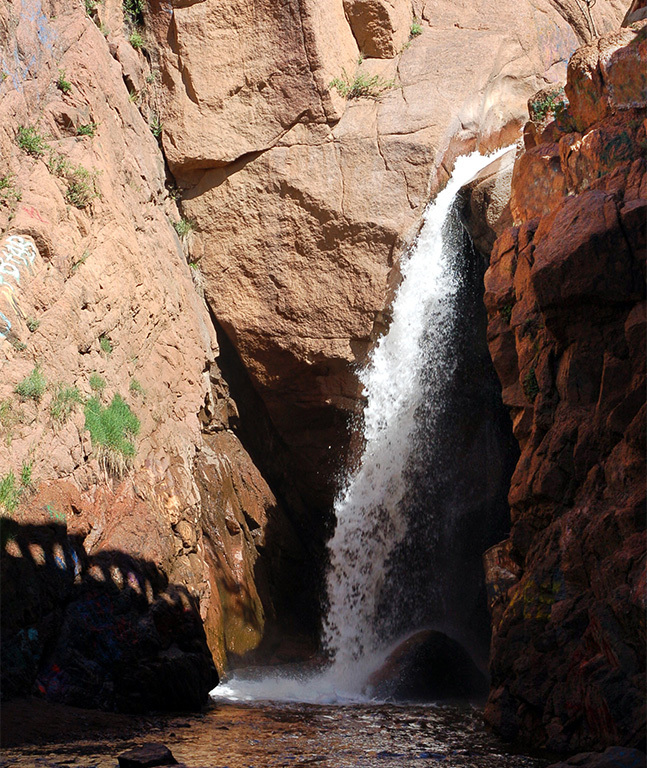 The Rainbow Falls Historic Site is near Manitou Springs in the west central part of El Paso County. The property’s boundaries are defined by the rights-of-way of U.S. Highway 24, Serpentine Drive and West Manitou Avenue. El Paso County Parks took over ownership of Rainbow Falls in June of 2010. For more than 100 years this small piece of real estate near Manitou Springs has been of interest to residents and visitors as well as the intersection of many man-made endeavors. The early residents of the area included the Tabeguache, or Sun Mountain people, a band of the Ute Indian tribe. The children of the Sun Mountain were considered to be the spiritual leaders of the tribe. The Utes, unlike most western plains Indians, were generally not nomadic and made the Colorado and Utah mountains their homes. They were the experts on the land and were sought out for their guidance as the area developed. They recognized the Falls as a special place. The Falls were originally thought to be named after the rainbow seen in the mist that came from the waterfall. One of the dominating features of the site is the historic 1932 Highway 24 Bridge into Manitou Springs. This bridge crosses the creek at the Falls. The bridge is listed on the National Register of Historic Bridges and is documented by the Colorado Historical Society. The bridge was one of many new bridges designed by the Colorado Department of Transportation in the 1930’s and was noteworthy because of its technologically significant open-arching concrete structural design. Special thanks go to the local non-profit organization, Manitou Environmental Citizens Action (M.E.C.A.). M.E.C.A. provides hundreds of volunteer hours and fundraising in support of the Rainbow Falls Recreation Area.